People overseas have asked if I can recommend a stored-value SIM package for them during their stay in Hong Kong, so instead of repeating my answer over an over I've decided to create a post. Before reading this post one needs to understand one thing about the mobile market in Hong Kong. It is very competitive and the rates and packages change frequently; around every six months. So aside from the following recommendations you should also verify my information when you arrive in Hong Kong. Another thing to be aware of. Except for speaking to Smartone-Vodafone, don't use the phrase "Stored-Value SIM" to describe what you're looking for, as most of the other 6 carriers do not know what that means. If you're not using a GSM mobile phone with a micro-SIM card then you have many options. Any of the 7 carriers: PCCW Mobile, CSL's 1010, CSL's one2free, 3 HK, Smartone-Vodafone, China Mobile and China Unicom, in Hong Kong will have stored-value SIM cards for you. It appears that 3 HK and China Mobile are the only carriers in Hong Kong who are willing to serve overseas customers that want to use mobile data on their phone while in Hong Kong. With the former offering 3G Data connectivity. Even though Apple HK has three official carrier partners for the iPhone: CSL, 3 HK, Smartone-Vodafone, and a total of four carriers that sells iPhone 4 tariff plans, there is only one carrier (3 HK) that offers stored-valued SIM packages with micro-SIMs. The type of SIM cards that 3 HK sells are those that can be either a regular mini-SIM or a micro-SIM (for the iPhone 4). Although, after you make the choice of turning it into a micro-SIM there's no way to go back. Conveniently all carriers' store-value SIM packages are available at 7-11 so you can make your choice at the Hong Kong International Airport before you get onto the Airport Express for town. Today is World Carfree Day and there were various government officials participating by taking MTR (Hong Kong's subway system) to work and to meetings. Yesterday the Hong Kong government announced its deal with Mitsubishi to purchase 10 Mitsubishi iMiEV electric vehicles, which it was testing since May 2009. These 10 electric vehicles will be deployed progressively through out different government departments through to May 2010. They will be testing the performance of these vehicles in day-to-day activities of the respective department. All this is Hong Kong government's push to adopt electric vehicle use in Hong Kong, to combat air pollution caused by combustion engine vehicles. What I don't understand is why the HK government did not support the locally designed, award winning, electric car, MyCar, designed and built back in 2004. I understand that the current model of MyCar may not be too functional for the kind of activities the HK government is thinking of at the respective departments, but due to the size of the MyCar, there are many things it can do much better than the Mitsubishi iMiEV. One great use would be to replace the police and fire vehicles on Lama and Cheung Chau islands. Come on we need to encourage local talents, especially when these talents are considered leaders in their respective industries. Started about 14:00 yesterday (August 17, 2009) Hong Kong time access to majority of the Internet web services hosted outside of Asia was unreachable. This first happened at my home with Netvigator Home Broadband service. I Tweeted about this hoping to get confirmation from others in Hong Kong. I also left to tried to see if the problem is localized to my building or district (Wanchai). I visited a Starbucks in Causeway Bay. After logging into PCCW WiFi connection at Starbucks I confirmed that most Internet web services were unreachable. A friend then came and logged into the PCCW WiFi University service and was able to connect to each of the web services I was not able to. So I proceeded to try using Smartone-Vodafone to reach these Internet web services. I was too successful in accessing these Internet web services via Smartone-Vodafone's HSDPA network. This morning China Unicom released an explanation, as reported by Shanghai Daily, the reasons for yesterday's Internet interruptions for its customers. PCCW's Netvigator service released a short news item in their Customer Service section of their web site, placing blame on "severe weather conditions" that caused "multiple submarine cable faults" claiming that "Some customers may experience traffic congestions" with"international traffic". I have encountered Error 500 for services I tried to access, but in Netvigator's "news item", it claims that their "systems are in normal operation and are working closely with partners to divert traffic". I cannot see how they can claim their "systems are in normal operation", when I had paid for and expects the delivery of broadband Internet service at 8Mbps. So I called Netvigator's Technical Support line, 1000, and filed a complaint and asked for details of compensation to customer for the interruption. According to Netvigator service policy, if any interruptions is longer than 24 hours their customer is justified for compensation. The Technical Support representative tells me that I should call back after the service is back to "normal", since they have no idea how long the interruptions will last. I asked the Technical Support representative if all Netvigator customers will be compensated after the service returns to normal, and he gave me a convoluted answer that basically say that not all Netvigator customers will experience the problem. So I ask for my official complaint to be logged. I suggest everyone who are effected by the PCCW's Netvigator Broadband Home service interruption to call Netvigator and demand compensation and to ask for your complaint to be logged. Today the Hong Kong Jockey Club (HKJC) announced the allocation of HKD7.5 million towards the Jockey Club Performing Arts Venue Subsidy Scheme. This scheme will offer rent-free venues to local art groups and individuals. This will enable local art groups a venue for them to hold performance or art installations. At the moment this scheme is only for the Blackbox Theatre venue, which is the theatre in the newly opened Jockey Club Creative Arts Centre (JCCA) in Shek Kip Mei. 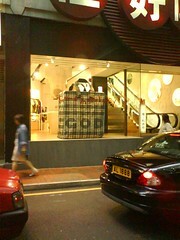 Where HKJC's funding enabled the conversion of a vacated industrial building into a art center. This is a move in the right direction for Hong Kong, as arts and culture is not that prevalent in Hong Kong. There are talks and much discussions about the West Kowloon and Kai Tak projects relating to arts and culture, but both of these projects are years away. Whether these projects will turn out as the government had intended, we will need to wait and see. In the past projects similar in intent had failed drastically, case in point is Cyberport. I believe more of the Hong Kong arts and culture venues should similar charity programs for local budding artists and performers. Refabricating City 2008 Originally uploaded by Vinko T.
Today I went to visit the "Refabricating City 2008" exhibition at the Hollywood Police Station, 10 Hollywood Road, Central, Hong Kong. 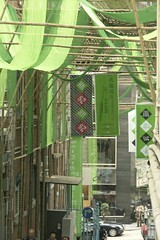 It showed off some of the urban development concepts from both the Hong Kong and Shenzhen city urban development. You can check out some of the photos from my Flickr album. This afternoon I was on a local bus; First Bus #115 license plate JV7020, going East bound from Central to Kowloon City. The outside temperature was a cool 18C, but the driver still had the air conditioner basting. The temperature in the cabin must be at least 16C. We continue to talk about saving the environment by reducing energy consumptions and the CFC (Chlorofluorocarbons) emissions from air conditioners, but the joe-public just don't seem to care. In Hong Kong they even made an official recommendation for all public transportations to maintain an in cabin temperature of 23.5C. At first when the government made this recommendation, all the public transport companies were advertising the fact that they were complying with the recommendations. Now after only a few months they have reverted back to their old habits. It this a problem of education? Its this an issue of selfishness? Or is it a social awareness issue? May be it is all of the above. I do not have a solution but for the sake of our future; on this planet, I hope people will be more aware. I guess my efforts to stop the Hong Kong government's decision to impose a GST in Hong Kong had not been in vain. The Hong Kong government announced today that they will, for the time being, put off the discussion of whether to impose a GST in Hong Kong. 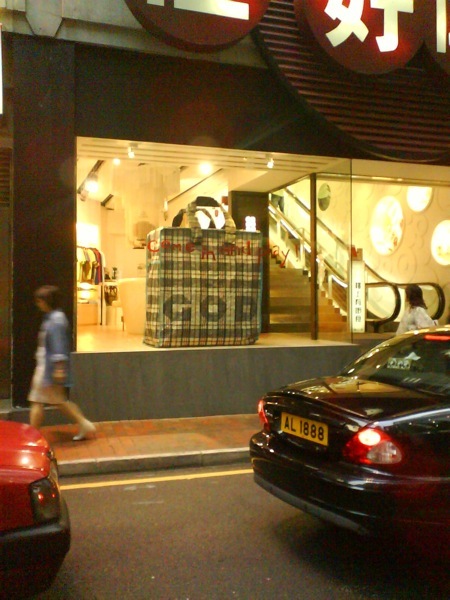 G.O.D., a local Hong Kong brand and home & living retail store, always have one of the more imaginative window display in their anchor store in Causeway Bay district in Hong Kong. This time it is a "red-white-blue" (literal translation) bag, which is a very popular inexpensive bag/container used by traditional Chinese and locals when they need to move a large quantities of stuff from point A to point B. Some times you can still see these "red-white-blue" bags used as luggage containers, by mainland Chinese and some rural residences of Hong Kong during their trips overseas. G.O.D. has always sold themselves as the "Hong Kong Brand" with very unique Hong Kong flavour designs. This latest windows display further supports their ability to capture the spirit of Hong Kong in their efforts to deliver this to the world. Have you walked along the streets of your city and notice from far the approach of tourist to your city? Why are these tourists stand out like a sore thumb? I am not talking about those who are trying to manipulate a spread out map, around and around, trying to get their orientation. I am not talking about the Japanese tourist who are snapping photos like paparazzi. I am talking about those tourist who are minding their own business and walking along the streets of our cities admiring the sights. For some reason they are very easy to spot. Am I being too nosy? Or am I just extra observant. I currently live in Hong Kong, and it is particular easy to spot those mainland Chinese tourist. I think it has to be the way they dress. I sure hope I do not stand out like them when I am a tourist in a foreign city. Next time you're walking down the street, take a look for yourself and see how many tourist you can spot. What I am referring to is the style of written English in Hong Kong; Hong Kong English aka. "Hongkish". I had wrote about this subject back in May of this year. The article stirred up quite a few controversy among people I know and the general public Netizens who read my Blog. I say "the written English...", because this and the majority of the previous article are based on signs displayed in public. "Do not smoke and put your feet on the bench"
So is Star Ferry Company saying that people who don't put their feet on the benches can smoke on the boat? "Please do not smoke or put your feet on the benches"
Another trait I noticed about Hongkish, is that it is usually the impolite version of the phrase. This is very puzzling to me, especially when the (Traditional) Chinese version is the polite form of the phrase rather than a command like the English version (Hongkish version). Please mind a moving gangplank when disembarking and embarking"
Please mind the moving gangplank when disembarking. When the sign is displayed well inside the boat there is no reason to mention embarking. I believe there should be an organization formed by the government or the Tourist Association of Hong Kong to correct all these public displayed signs, before they embarrass Hong Kong any further.